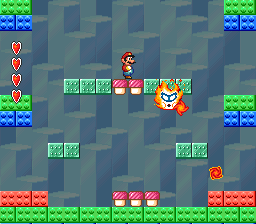 World 4-3 (Chapter 4-3 in Yume Kōjō: Doki Doki Panic; titled Cross the Ocean and Move Up) is the third level of World 4 in Super Mario Bros. 2. Pink Birdo is seen as a seemingly normal enemy early in level, and reappears after being defeated whenever the player reenters the room it is in. This allows it to be defeated an infinite number of times for a massive amount of points. The actual purpose of this out-of-place Birdo is for the player to ride on one of its eggs across the otherwise impassable ocean to reach the main dungeon where Fryguy's lair is located. In the Super Mario All-Stars version, if this Birdo is hit by a large vegetable during her last hit upon defeat, the sound effect of an object appearing will play, even though she does not spit out anything. ↑ Super Mario Bros. 2 Inside Out, Part I. Page 32. This page was last edited on April 6, 2019, at 19:39.